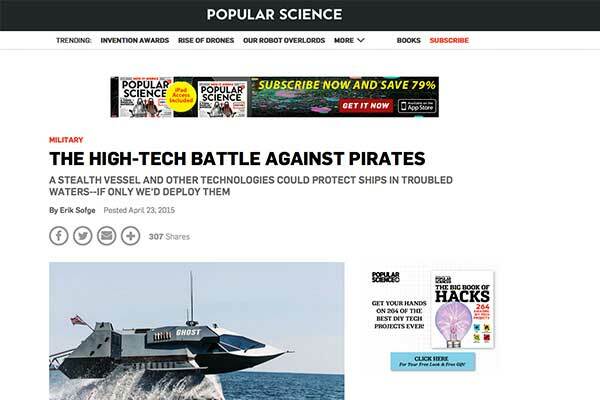 Popular Science’s April 23, 2015 article by Erik Sofge entitled, “The High-Tech Battle Against Pirates – A stealth vessel and other technologies could protect ships in troubled waters–if only we’d deploy them” sites Unifire’s Force 80 Anti-Pirate Water Cannon for close range protection of ships against pirate attacks. CLICK HERE to read the article. Desperate times call for desperate measures, such as trying to hit an incoming pirate vessel with high-pressure water from a fire hose or water cannon. Since targets are likely to fire back, the remote-controlled Force 80 water cannon, made by Unifire, can launch 1,321 gallons of water per minute at a range of 93 yards without exposing its operator to gunfire. According to Unifire, its new generation of Force 80 robotic nozzles now can be controlled not only by standard and wireless joysticks, but even over any web browser or the Internet and can be easily networked with other systems. More information about Unifire’s robotic nozzles can be found at RoboticNozzles.com.